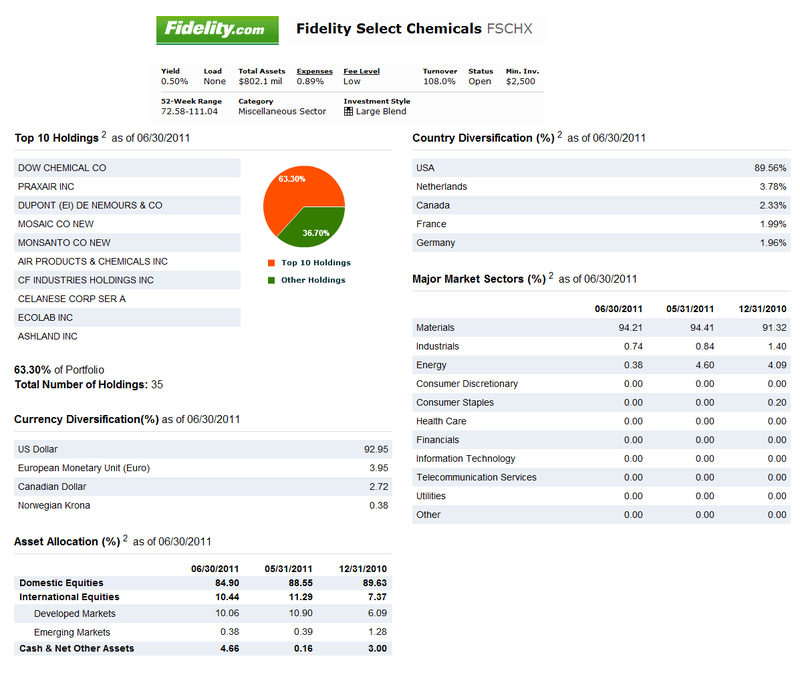 One of the best sector equity funds is Fidelity Select Chemical Portfolio. This fund primarily invests in chemical companies. Details about the fund's review can be found below. The Fidelity Select Chemicals Portfolio fund seeks capital appreciation. 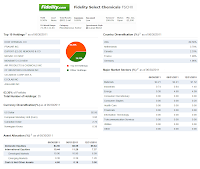 This Fidelity fund invests mainly in chemical process industries common stocks. This chemical process industries companies mostly engage in the research, development, manufacture, or marketing of products or service. This fund may invest in securities of foreign issuers. It is non-diversified. The fund's manager is Mahmoud Sharaf. He has managed this fund since April 2010. This fund was introduced to public in July 1985. This Fidelity fund has 0.89% annual expense ratio. This figure is lower than the average in the category which is 1.09%. It also has a yield of 0.50%. It also has net assets of $802 million. Please note, this fund can be very volatile compare to any index funds, hence it is a specific equity sector fund. Therefore, Morningstar granted this fund with 4-stars rating. The best 1-year total return was achieved in 2009 with 65.32% while the worst in 2008 with -43.34%. There is no other class available for this fund. Since its inception, this fund has recorded 21 years with positive return and 4 years in negative return. To invest in this fund, you will need $2,500 for the minimum initial investment in brokerage account and $500 for IRA account. There is no management fee and no front-end sales load fee as well. This fund is available in various brokerages such as Vanguard, JP Morgan, T Rowe Price, Common Wealth PPS, TD Ameritrade Inc, Mony Securities Corp, Royal Alliance, Schwab Retail, EP Fee Large, Firstrade, etc. This Fidelity fund has a total of 35 holdings as of June 2011. The top ten holdings are Dow Chemical Co, Praxair Inc, Dupont (Ei) De Nemours & Co, Mosaic Co New, Monsanto Co New, Air Products & Chemicals Inc, CF Industries Holdings Inc, Celanese Corp Ser A, Ecolab Inc and Ashland Inc. The top 3 market sectors of this fund are Materials (94.21%), Industrials (0.74%), and Energy (0.38%).